Brothers and sisters in Christ, grace and peace to you from God our Father and our savior and lord Jesus, a gift born for us today. Amen. A couple of weeks ago, I was walking through the hallway at the church and passed by an excited young man – probably about 5 or 6 years old. He wanted to show me a picture of the nativity scene that he had just colored while he was with his family in worship. “That’s a beautiful picture. You’re a great artist!” I said. And then I said, “You said that Mary’s husband’s name was the Virg. Are you sure about that? Wasn’t Mary’s husband’s name Joseph? Now I hope you hear the humor in that conversation. And I also hope that you hear the concern I have in conversations like that as one of your pastors. If you and I are being honest with ourselves, every one of us has felt the same way this young man felt about what Mary’s husband’s name actually was. I mean, come on – who really knows what “figgy pudding is” or “a yonder virgin” or a “natal star” that we sing about at Christmas? Number 5. Hey! Now there’s a gift. 4. Boy, if I had not recently gained 200 pounds, this would fit perfectly. 3. Gosh, I hope this never catches fire! 2. I love it, but I fear the jealousy it will inspire. And the number 1 thing to say about a Christmas gift that you’re not quite sure about. I really don’t deserve this. Please listen carefully – the gift that you and I were given on that first Christmas is the best gift any of us will ever receive. A gift that you and I don’t deserve, but a gift that we receive anyway. When we hear the Christmas story as we just did during worship on this most holy of days, do we hear it as a boring old over-romanticized theatrical production that we’ve heard a million times before? Do we hear it today and still think that Mary’s husband’s name was the Virg? Or do we hear it again as if this was the very first time. I think the writer of Luke’s gospel wants us to hear the Christmas story like it’s the very first time we’ve ever heard it – every time we hear it. Luke wants us to see the faces of the shepherds, to see the faces of Mary and Joseph and the animals, to see the face of the baby Jesus and to find ourselves once again filled with awe and wonder, to find ourselves glorifying and praising God for all that we are invited to experience in Jesus – who came to us as a child. Luke doesn’t want us to simply be fascinated by the Christmas story’s romantic quality and splendor. Luke is inviting us to explore the Christmas story’s depth. The unconditional and undeserved love that God has given us in the gift of this child. A gift calls us to live beyond setting aside a few hours each year to remember its significance or spending all of our energy believing that if we just work hard enough, God will pay more attention to us than he does to our neighbor. I don’t know why you are here today. I won’t pretend to know whether you even believe in this gift that God has given to you in a child named Jesus. I don’t know – maybe you’re here because you feel a sense of obligation to go to church at Christmas or maybe it’s a tradition for your family to worship on this day and you didn’t want to hurt their feelings and let them down, so here you are. Maybe your spouse or grandmother made you come. Or maybe you’ve experienced a significant loss in your life this past year and you’re trying to recapture that old feeling of past Christmases. I don’t know why you’re here. But I’m glad that you are. What I do think and what I do believe with everything that I am as a pastor and I do want you to hear today is this – you and I have been given a gift. A gift from God that we celebrate today that’s not given to those who deserve it the most or have worked the hardest to be good this year. The gift of Christmas is that the God of all creation, the One who created you and loves you, knew that we could never find our way to God on our own, so God came to us. God went on a quest for us. And God’s never-ending quest to come to us is the good news of Christmas that we received as a gift. Usually when a baby is born, we like to hold the little one. This baby, this child born in a manger, came to hold us. To embrace us with a love that wakes us up and makes us new each day. I pray that God coming to you and me and embracing us with love through the Christ-child – is a gift that you and I will share with everyone we meet in the coming year. Merry Christmas! 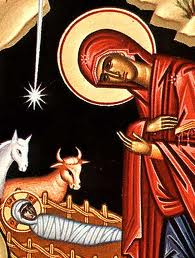 Christ our savior is born! Thanks be to God for this gift. Amen. This entry was posted on Sunday, December 25th, 2011 at 4:42 am	and posted in Recent Sermons. You can follow any responses to this entry through the RSS 2.0 feed.